Ecuador, in Spanish means “equator” and the name was given because it runs straight across the northern part of the country. Ecuador is the second smallest country in South America and one of only two that does not border Brazil. Her neighbors are Colombia to the north and Peru to the east and south. Her western border is on the Pacific Ocean and she holds the amazing treasure of the Galapagos Islands, 600 miles off the coast. Ecuador gained independence from Spain in 1822 and became part of Gran Colombia, then gained full independence in 1830. The capital city of Quito is the oldest in all of South America and is renowned for its well preserved 17th century, colonial architecture. Ecuador’s Quito became the very first UNESCO world Heritage site because of this. The country is beautiful, with breathtaking topography and has two mountain ranges that split the nation into three basic regions; Coastal, Andean and Amazonian. The official language is Spanish but Quichua, an Incan language, is spoken by the indigenous population along with 13 other native languages. Ecuador’s largest ethnic group (65 percent) is mestizo, a mix of Andalusian and Castilian Spaniards. Twenty five percent of the population are Amerindian and the balance are Caucasians of Spanish or other European descents and Afro-Ecuadorians. Ninety five percent of the people are Roman Catholic, which is the official religion of Ecuador. However, freedom of religion is part of the country’s constitution. Speaking of the constitution, Ecuador was the first country (in 2008) to declare that “nature” has constitutional rights. Ecuador has many active volcanos, one of the greatest densities in the world. She is home to incredible mountain peaks, with 10 that are over 16,000 feet in altitude. Mount Chibrorazo is the highest in Ecuador, at 20,565 feet. This peak, because the earth is not a perfect sphere and bulges at the equator, gets the prize for the furthest point from the center of the earth and the closest to the sun. Another interesting statistic is that at the equator, there are twelve hours of daylight and twelve hours of night, every single day of the year. No daylight savings time is necessary in Ecuador. Her rich, volcanic soil makes for wonderful plant life. There are 25,000 species of plants present in the country, which represents about 10 percent of all known plant species in the world. They estimate 4100 species of orchids grow there, including the world’s smallest, measuring only 2.1 mm wide. The bark of the cinchona tree was used to develop the first drug to prevent and treat malaria, called Quinine. Of course, with all this wonderful plant life, comes all sorts of species of birds; over 1600 species call Ecuador home. They also have the world’s highest diversity of hummingbirds. The currency in Ecuador is the US Dollar. Previously it was the Sucre. In 1999 the country went through a massive devaluation of their currency paired with hyper-inflation. The move to the dollar was swift and has worked well so far for the Ecuadorian economy. The government has made massive investments in education and infrastructure which has improved life, especially for the poor. 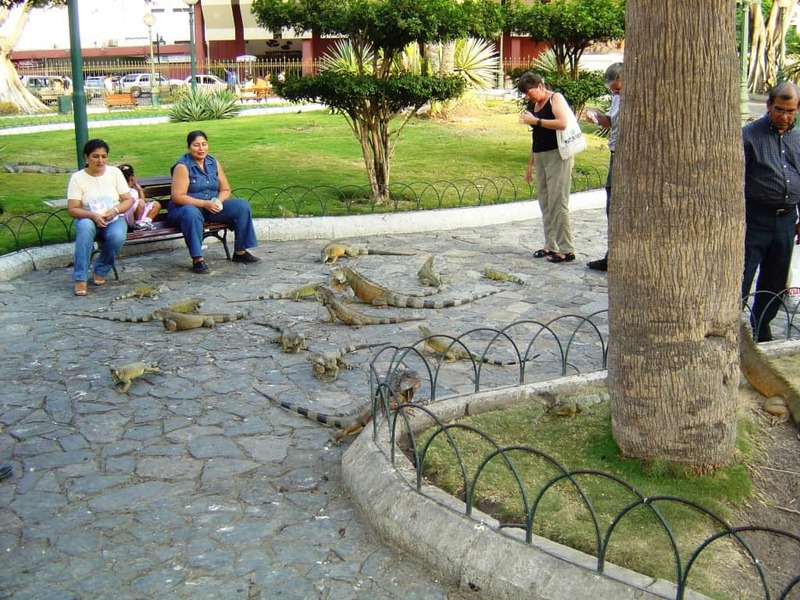 Ecuador is always at the top of the list as a retirement destination. It is inexpensive to live there, they have a pretty good health care system (ranking number 20 in the world) and they respect Ancestral medicine, which is very important to the indigenous population. They honor the elderly with nice discounts. They are also known as one of the friendliest countries, as anyone, from any country can visit for up to 90 days without a visa. One place that I must mention is called Vilcabamba, also known as the “Valley of Longevity” or the “Lost Garden of Eden.” It is a valley that lies about 5000 feet above sea level, with rich volcanic soil and crystal clear water from the Andeans. This valley is known to be one of four places in the world with the highest number of citizens who have lived past the century mark, some living even as long as 135 years. The secret, they claim, aside from the beauty that simply penetrates the soul, is the water. Other factors may be that they use no pesticides or chemicals and have only have one electro-magnetic field, which is a cell tower. The valley has become a destination for tourists looking for the fountain of youth. When it comes to tourist destinations, the Galapagos Islands are on many a bucket list. Famous for its unique wildlife, like the blue-footed boobies, with their famous mating dance, frigates, with their crimson, red ballooning chest, giant tortoises, resembling ET, land and sea iguanas, and sea lions that frolic with divers. The Galapagos is also where Charles Darwin studied the origin of species and formed his theory of evolution. 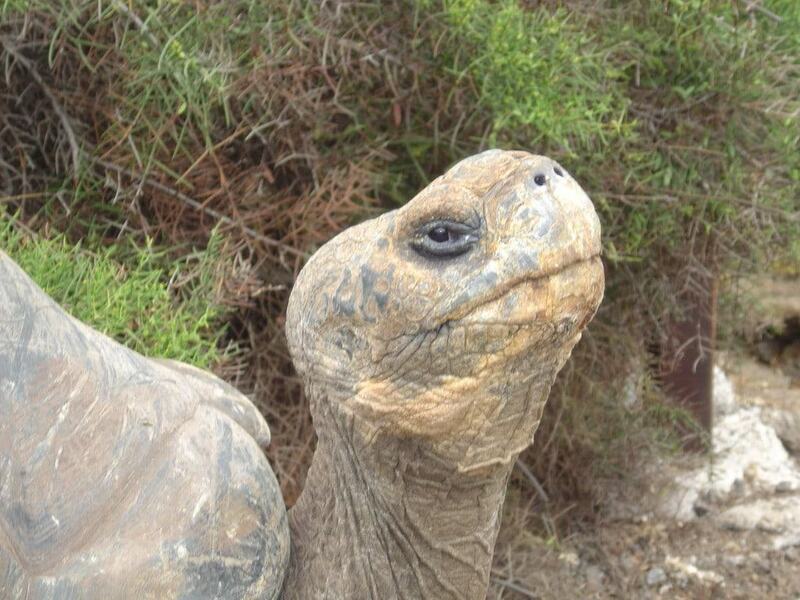 There is a Charles Darwin Research Center on the island of Santa Cruz, home to many species of tortoises, which included Lonesome George, the last of his subspecies, who died in 2012 at over 100 years old, with no offspring. To see all that the Galapagos has to offer, you can either stay at a hotel on one of the four inhabited islands and take day trips to other islands or lodge on a ship and travel the islands that way. Even our beloved author, Zane Grey, made it a point to visit the Galapagos on his yacht called Fisherman One. 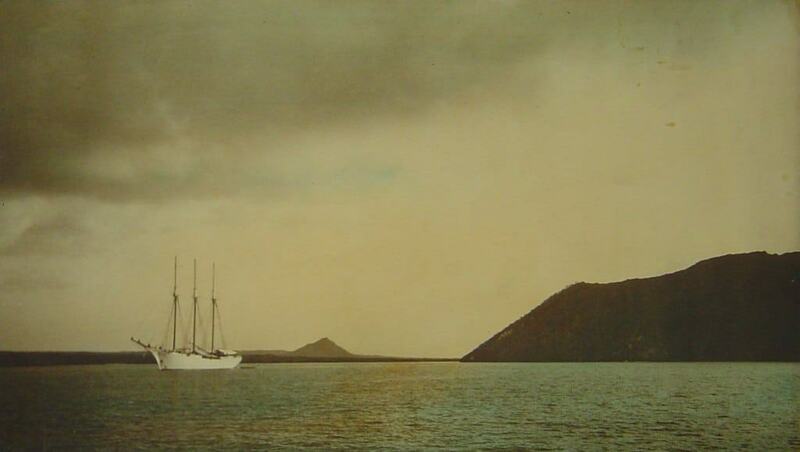 His travels there in 1924, were to be a scientific expedition, along with fishing but inspired his book called “Tales of Fishing Virgin Seas.” Here is a beautiful, colorized picture of his yacht, just off Eden Island in the Galapagos that is part of our Zane Grey collection. As we look into the cuisine of this beautiful country Ecuador, we see it is shaped by the various regions, which all have the influence of Spain and the indigenous people. Potatoes, maize, plantains and yucca or cassava are staples. Seafood is obviously abundant in the coastal regions and meat is more prevalent in the mountain and highland regions. One interesting thing they eat there is guinea pig. They call it cuy and it’s considered a delicacy. I understand it is quite good but for me, I had a pet guinea pig named Ginger and don’t think I could do it. Then again, I have chickens and yes, I eat chicken, so ….. maybe? 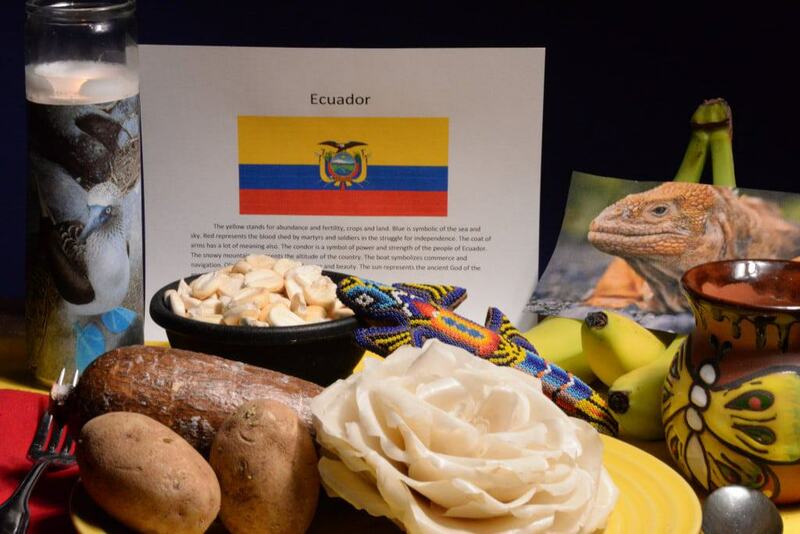 We set the table in the colors of Ecuador’s flag; yellow, red and blue. We decorated with pictures of their wondrous creatures, like iguanas and blue footed boobies. We put on our Panama hats. Yes, Panama hats originated in Ecuador. The finest are made in a town called Montecristo. We then put on some Marimba music that the Afro-Ecuadorians made famous. In fact, music played an important role in the ancient Andean peoples’ lives. Archeologists have discovered all sorts of musical instruments in ancient tombs. Music is still very important in the lives of the people today. They say Ecuadorians also learn to dance when they learn to walk. We began our meal with a toast, “salud” (cheers) and “buen provecho” (enjoy your meal). Our first course was an unbelievable shrimp ceviche, which we ate continental style. 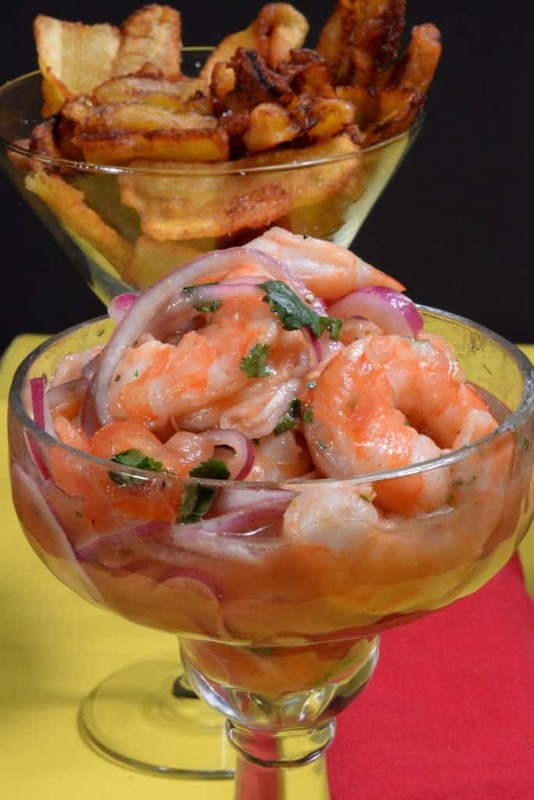 Ceviche is popular all over but especially in the coastal region. It is made with ketchup in it, sometimes mustard too. It was awesome and we paired it with a nice, cold “cerveza” (beer). The ceviche was served with a very thinly sliced, fried green banana which provided a lovely crunch to the ceviche. Next was a fish soup, topped with pickled onion and tomato salsa and garnished with avocado and lime wedges. 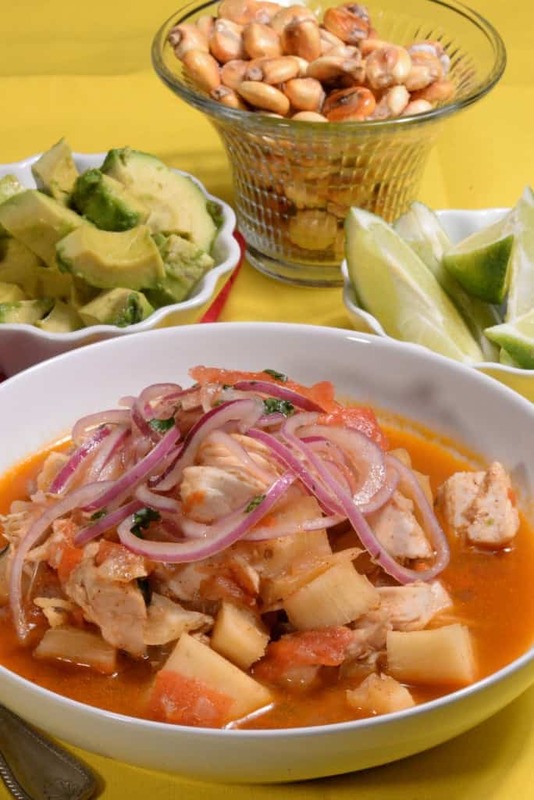 This is a very popular dish and for good reason, it has wonderful flavors, great broth and is even considered a hangover cure, if need be. 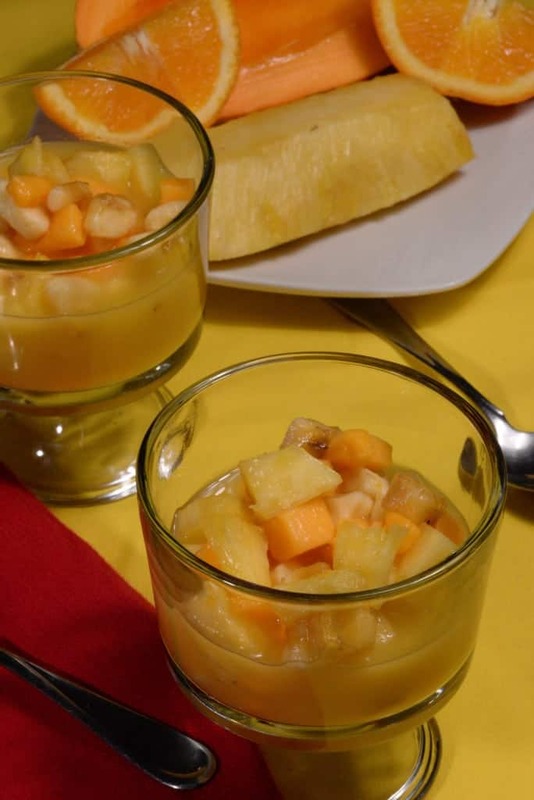 It is served with toasted corn nuts, another popular snack in Ecuador. It was stupendous. For the main course we enjoyed Llapingachos. These are potato patties, stuffed with cheese then topped with a peanut sauce and more of that delicious pickled onion and tomato salsa. Plus, we added aji criollo; a wonderful salsa made with chili, cilantro and onion; a must have condiment, found on all Ecuadorian tables. The patties were served with avocado slices, a fried egg and grilled chorizo. This could be enjoyed for breakfast, lunch or dinner. 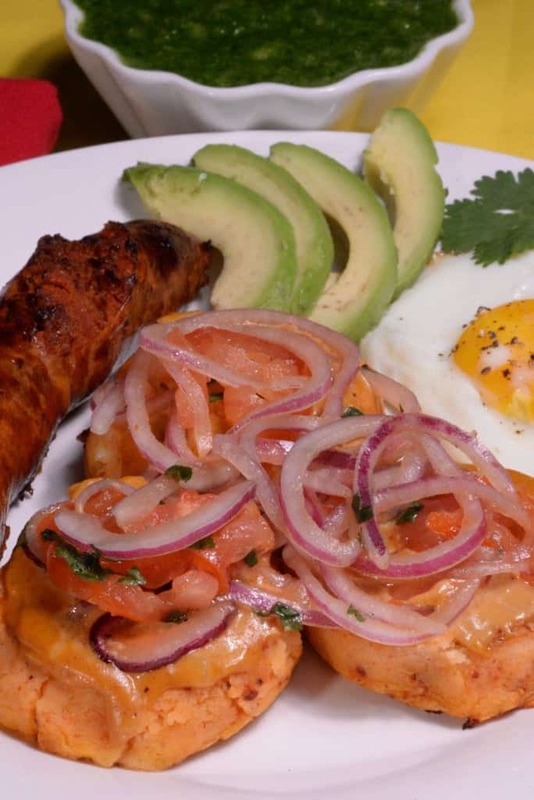 By the way, in Ecuador, lunch is the big meal of the day, eaten around 2:00 pm and followed by a siesta (nap). For dessert we served a drinkable, tropical fruit salad. Fruit drinks are ubiquitous in Ecuador and this easy and light fruit drink was the perfect ending to our outstanding meal. Anger of the mind is poison to the soul. Hands that give, also receive. The strong forgive, the weak remember.